In the not-so-small-anymore world of indie polish, a few relatively new brands truly rock! Today I have a couple of her "older" shades to share with you. Santa's Little Helper is a blue based green enlightened by a strong gold and copper flash of shimmer. I LOVE this color so much! I'm pretty sure it could convert any green hater! I used 2 coats plus topcoat here. 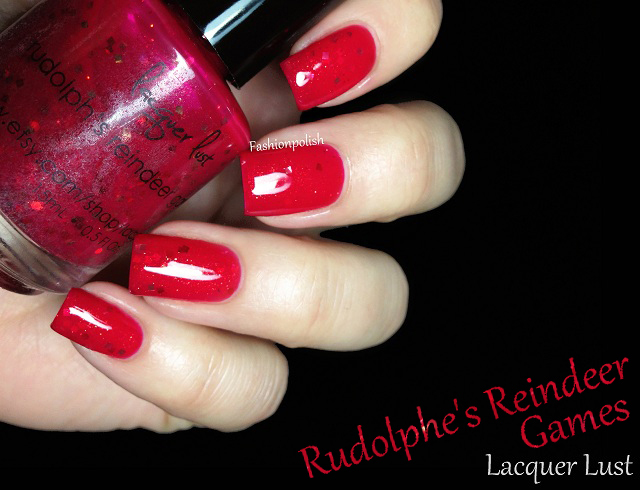 Rudolphe's Reindeer Games is gorgeous blue based red with a mix of gold shimmer as well as red and gold glitter in hex and square shapes. I can't help but love red whenever I swatch it and this one's pure perfection! Again, 2 coats plus topcoat here. 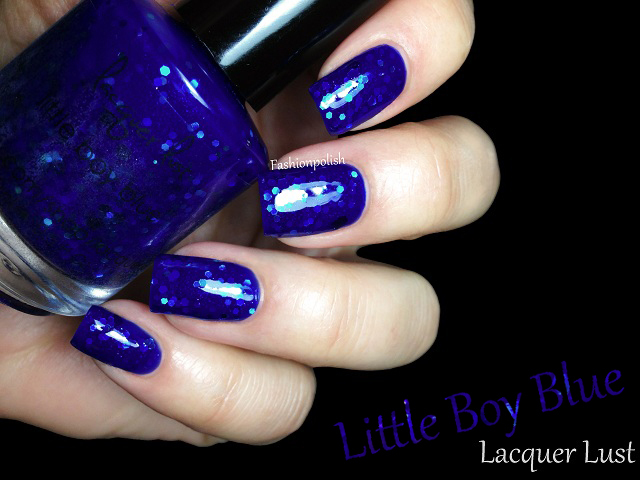 Little Boy Blue is one of Lacquer Lust's hit shades and a glimpse is enough to understand the hype! Dark blue, leaning blurple base packed with turquoise and green hex glitters, I mean just look at it! Formula was a little thick on this one but oh so worth the effort. 2 coats plus topcoat in this swatch. 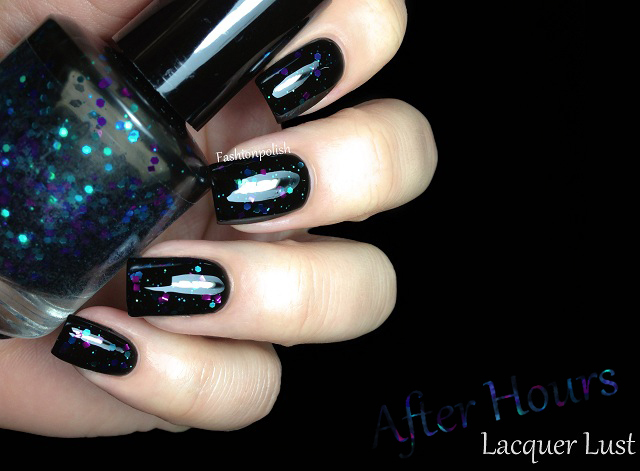 After Hours is a black jelly with a mix of turquoise, green and purple glitters, small, medium, hex and squares. Black with a touch of color : my favorite shade of polish! Everything is perfect about this, even opacity was surprisingly nice with a 2 coats perfect coverage. And finally, we have Galaxy Glam : another black, packed with multicolored shimmers this time. Dark, mysterious and simply amazing! And again, 2 coats plus topcoat. 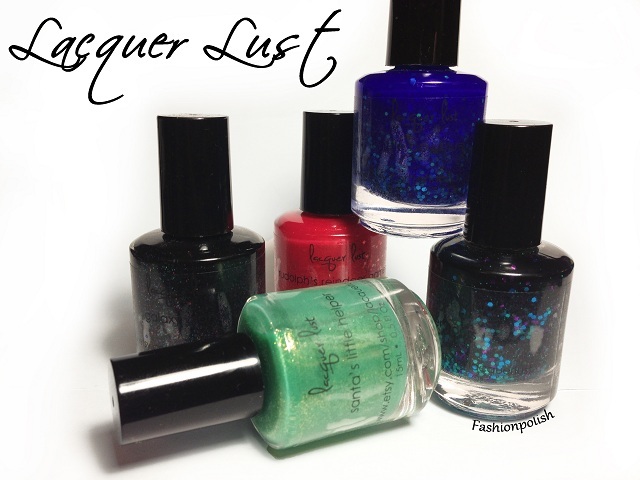 Lacquer Lust is available on Big Cartel and retails for $7.50 each. I strongly encourage you to follow Jo on Facebook and Instagram to be informed on new collections as well as restocks. Santa's Little Helper is my favorite! Loving Little Boy Blue! Purples and blues always get me! What a gorgeous and well composed Collection!!!! And another set of your perfect swatches <3!!! The green and the blue are my favorites!!! My favorites are Galaxy Glam and After Hours - I'm a big fan of colorful blacks! That being said, Little Boy Blue is intriguing me - your description of it really sold it. Thanks for the gorgeous swatches! I definately love them all! nice colours! how did you do the snow falling?? really cool effect! Oh wow, After Hours and Galaxy Glam are my favorites!! Little boy blue and after hours are my favourites, and looks gorgeous on your nails. Wow I like the blue boy!! Santa's Little Helper is a little bit unusual colour for nail polish but it sure does stand out. I will try it my self. I LOVE Little Boy Blue, After Hours, and Galaxy Glam!! !